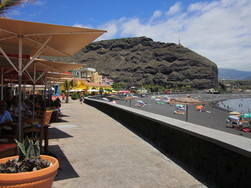 Apartamentos Lisa and Leal are self-catering apartments in the small seaside resort of Puerto de Tazacorte in the west of La Palma. Situated in the very attractive 'Edificio Orion' which is set back a little from the road, they are just a few minutes walk to the beach and also close to the small supermarket, shops and restaurants. Both apartments have free WiFi. The balcony has an excellent sea view and yet slightly apart from the hustle and bustle of the seafront. The apartments measure 70 m2 in total and are exceptionally spacious - ideal for 4 adults or a family holiday. The kitchen has an oven, four-ring hob, fridge/freezer, toaster, kettle, ironing board and washing machine. The apartment has two large bedrooms, one with a double bed (150cm x 2 m) and one with twin beds (two singles) which can be put together if required. The two bedrooms and bathroom are separated from the lounge and kitchen by a door. The beautiful beach of Tazacorte is just a 2-minute stroll away. Want to hire a car? Click here for details of a highly reputable La Palma car hire company. Apartment Leal is very similar to Apartments Lisa (with the same owner). However, it has two twin-bedded rooms and faces inward towards Pico Bejanado and the Caldera. The kitchen is well-equipped and has fridge, microwave, oven, 4-ring electric hob, washing machine, iron, coffee machine, toaster and electric kettle. In the lounge / dining area, there is a television with satellite/cable TV plus the sofa converts to a bed for an additional person.Towels and sheets are of course provided and there is a hairdryer. The apartment is on the second floor and there is a lift available. Sorry, pets are not allowed. A five-minute stroll away is the marina of Tazacorte where it is possible to take a boat to see dolphins and whales. 25-minutes away on foot or a few minutes by car (1.5km) is the town of Tazacorte with its historic church, banana museum and old, narrow streets.